All in all, it's been a smooth experience but if you're a developer yourself, you know that this type of refactorings never happen on a straight line, there are always bumps and quirks along the way. TypeScript shares the same concept of a module as ES6. TypeScript's module import and export syntax is very similar to its ES6 counterpart but the CommonJS module system that Node.js uses is different. Look at the code below and see what happens when "ideas.js" has to load a module from "AdminRepository.ts". All of a sudden you have to use the "default" property to be able to access the exported object. Eventually, when the consumer (idea.js) is also converted to TypeScript, the problem will go away. Before 2.0 release of TypeScript, finding and using these type definition files could get a bit painful and confusing - same goes for creating them. TypeScript 2.0 fixed some of these issues by introducing a simplified declaration fileacquisition model. Starting with TypeScript 2.0, these type definition files are regular npm packages. 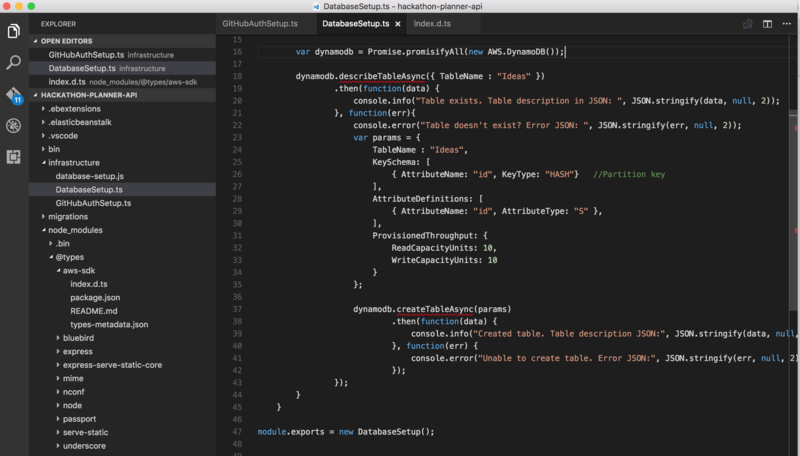 After downloading the type definition file, VS Code stops complaining. Furthermore, I get all type safety features and intellisense while using this library, which is what I want and why I use TypeScript. On the other hand, sometimes a library you're using might not have a type definition file. For example, I'm using a passport extension library called "passport-github2" which doesn't have a definition file yet (and probably never will). Inside any TypeScript file that uses this library, VSCode complains that it doesn't understand this library. TypeScript compilation also results in the same error. But even though the typing file is missing, the actual library is there and it works during run-time. But of course we've a problem here. The problem is that the TypeScript compiler will complain about this missing type definition file forever. Being a good developer, what you want to do is to avoid having these kinds of error messages lying around and being ignored. Having said this, it's worth mentioning that people are complaining about this aggressive behavior of TypeScript, as it eagerly wants all 3rd party packages to have type definition files. But there's probably a solution coming. for that library in a separate file - either marking it with 'any' keyword or with proper types. Sometimes a type definition file (.d.ts file) turns out to be incorrect or incomplete. The screenshot below shows a situation where the package "aws-sdk" has an incomplete type definition. It doesn't know that "endpoint" property exists even though it does exist in AWS documentation. I literally went into the type declaration file I downloaded via npm and added the field "endpoint" in there to fix the problem. Probably I have to commit this file into source control now. Unfortunately I couldn't find a best practice that explains how to properly handle these situations. For now, I'll go with the solution of manually fixing the definition file and adding it into the source control. Below you can see the patch I made to the declaration file of AWS-SDK (line commented out). Let's first look at a simple case that doesn't make use of modules. Here below there's an interface and its implementation right below it. See how AdminRepository.ts refers to IAdminRepository interface without any ceremony. Now look at these other two files, in which the interface exposes a third party object and therefore has to import that third party module. Note that index.ts can't just refer to that interface anymore, without actually importing it. By the way, I also noticed that TypeScript coding guidelines do not recommend using "I" as a prefix for interface names. So I need to hold my C# reflexes.